Why Did Channel 4’s Hollyoaks MOCK Disability? It was in Monday’s episode in which Hollyoaks made the awful decision to compare a colostomy bag to an awful way of living. Disgusting, right? To many, it may seem like a harmless joke. But to others living with an ostomy bag? Not so amusing. I didn’t find it funny in the slightest. In this episode, a nurse states “seriously, I’m going to have more fun changing colostomy bags”. I thought this to be nothing but a cheap comment that could have been left out with no harm done to the script. How in anyway is it right to compare a negative way of living to a disability? It’s not for the fact that it is degrading to those who live their lives with a colostomy bag, but more towards the point that the comment was just downright unnecessary within the script. What was the need? Nothing but bad humor that I’m sure hit hard to a lot of people who’s lives have been turned upside down at some point in their life, increasing their need for a colostomy bag. Not only was this wrong for those lines to be broadcast, but also to be coming from a character who works as a nurse. It’s comments like those that you wouldn’t expect to hear from somebody who has chosen a medical profession, let alone to be written for a soap. It is obvious to me that the writers for this episode did not take the time to look further into the words they deemed somewhat amusing, therefore showing a complete lack of empathy to those facing these medical conditions, alongside showing less passion for their own profession. For a programme that attempts to battle story lines such as mental health and eating disorders, which attempts to show an understanding of the harsh realities that some people face on a daily basis; why do they then feel the need to contradict the image they once perceived by creating more stigma for something that is already so taboo? Hollyoaks tends to have a younger audience, and maybe that fact that stomas and ostomy is such a taboo subject, has something to do with the line included in Monday’s episode. Perhaps the writers didn’t think about the fact that young people too can encounter a calostomy at one point in their life, be it temporary or permanently. It saddens me to think that the writers probably just added this into the script to create a couple of laughs, but at what expense? They are aiming to reach out to todays generation, but how can they do this if they feel it is right to continue laughing at someones expense? Further more, how can such a huge television company allow this to be broadcast? I’m sure to many people this line will be perceived by viewers as the writers intended, but for many living life with an ostomy, who have had to deal with health scares and discomfort throughout life, this comment could hit hard. Why should others feel it is okay to make a joke out of someone else’s poor health? With Hollyoaks being broadcast to millions across the UK, these types of comments lead to destroying the hope that the stigma around stoma and ostomy will one day end. How can we be brave and confident, if it’s nothing but a shameful joke to millions of people? 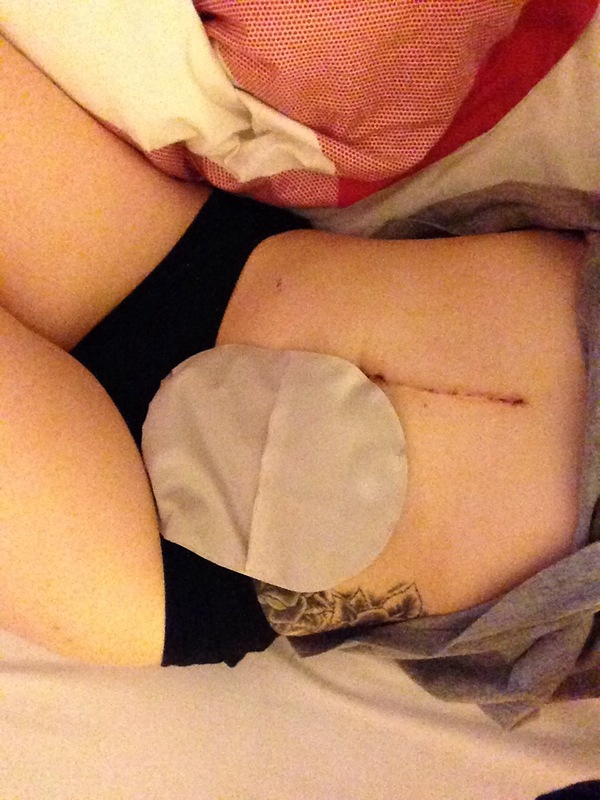 What Happened When My Stoma Bag Leaked… In Bed With My Boyfriend! I never saw the program but I heard about this scene. I think it’s disgusting to even allow this in the script. Awful!